After graduation from Kansas State University, Ben worked with his father, Dr. John Schroeder, prior to assuming ownership of Cedar County Veterinary Services. He and his wife, Dr. Erin Schroeder, have two sons and an ornery housecat, "Migos". His hobbies include horseback riding, watching movies, and being a sports fan (especially for his own boys). He is involved in the Veterinary Associations of Nebraska, Iowa, and South Dakota, and is a Certified Beef Quality Assurance Trainer. In his spare time, both he and Erin coach boys youth basketball. Erin grew up in Westport, New York, a small town located on Lake Champlain. She always knew that she wanted to be a veterinarian and grew up with dogs, cats, and horses. She graduated with a B.S. in Biochemistry from Syracuse University where she also played basketball for the Orangewomen. In 2001, while getting her DVM at Kansas State, she met her husband, Dr. Ben Schroeder. They have two boys, Charlie and Chase, who currently want to be professional basketball players! Dr. Erin loves interior design and working on home improvement projects. She also enjoys cooking, coaching and relaxing with the boys and Ben. Bailey is from North Bend, NE and she grew up taking care of hogs and showing cattle and horses. She served four years in the Air Force as an air traffic controller which set her up to finish her B.S. in Animal Science from UNL and go on to get her DVM from Iowa State University in May 2015. As an undergraduate she focused a lot of her studies on cattle reproduction which led her to really develop a strong interest area of cattle genetics, AI, and embryo transfer in veterinary school. Overall she has a great deal of respect and passion for the business of farming and ranching and is excited to be in an area to help serve the families and industry through animal health and care. Other interest areas include traveling, Husker football, boating and wakeboarding in the summer, snow skiing in the winter and about any thing to do with the outdoors in between time. 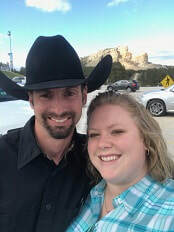 Bailey married her husband Austin in 2007 who is originally from this area and they currently have two dogs (Wrangler and Cinch), a cat (Sam), and lots of plans for other species including cattle, horses, and someday children! Dr. Samantha is a Nebraska native who went to Kansas State University for veterinary school before moving to South Dakota for work. She met her husband, Nathan, here, and they have settled on his family farm near Menno, SD. Dr. Sam has worked for several years in large and mixed practice, but is excited to make the move to mostly small animal. She particularly enjoys surgery, and is looking forward to helping the team any way she can. At home, Dr. Sam has an indoor cat named Daniel, a Golden Retriever named Jack, and four outdoor farm kitties along with the cattle.